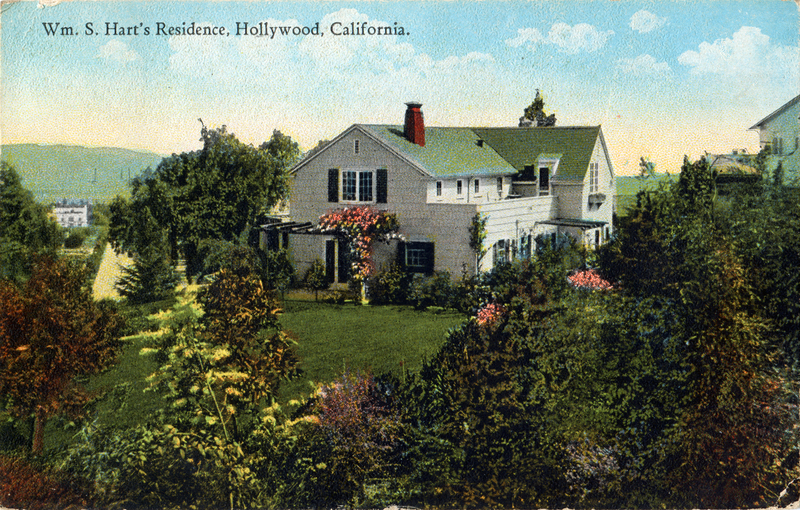 Rear view of William S. Hart's home at 8341 De Longpre Ave. in Hollywood (now West Hollywood), built in 1919. Compare to this 2011 view to see the signifanct upstairs addition and the second-story walkway connecting the house and garage. Postmarked February 28, 1924, at Arcade Station, Los Angeles, Calif. Arcade Station was a Southern Pacific depot and post office located on Fourth Street and Alameda, on the former site of William Wolfskill's orange groves. LW2464a: 19200 dpi jpeg from original postcard purchased 2013 by Leon Worden.